I have had such a great time looking at so many blogs and gleaning great ideas off of them. :) One was the idea of posting from the past. 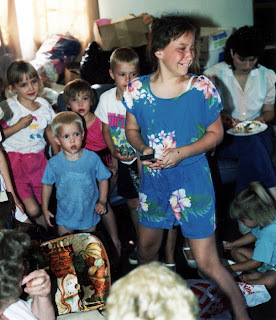 One of my friends Kelly does Throw back Thursday-super cute. So I thought about what day really would be do-able on a weekly basis and then started coming up with cute names for them. Monday's Memories, Touching Tuesdays-waayy too cheesy, What were we thinking Wednesday's... But in the end I decided to go with Flashback Friday's. I hope you have as much fun reading these fun little memories from day's gone by as I do posting them. Joey was my favorite. I remember sitting on my kitchen counter listening to "Please, don't go girl" and stopping and rewinding phrase by phrase to memorize it! I think my (and just about every other girl in America my age) obsession with them could be compared to how a generation before us felt about the Beetles. Too bad their obsession was warranted and ours was a fading fad. But-somehow the music industry has decided that we don't have enough crappy singers on the radio and so they have brought the group back together for a come back....wow. :) LOL! 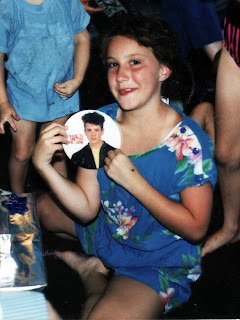 Here I am with a button of my favorite NKOTB, Joey McIntyre. That button was stuck to a jean purse I had for the longest time! Just in case you were wondering, The tape I am holding in the second picture is a NKOTB tape (I really want to say DUH here) and yes, it has the song "Please, Don't Go Girl" on it. Several, SEVERAL years ago I cleaned out all my NKOTB stuff. But my sister Janece couldn't let me throw it all away. She decided we needed to keep at least some of this stuff for posterity sake. She has all my tape cassettes still. Just a few months ago I heard "Hangin' Tough" on the radio and called her laughing. I told her she wouldn't believe what I had just heard on the radio! Then a day or so later she and I were driving back from shopping and heard it. We both had another good laugh. We even joked that we hoped they weren't playing their songs in an effort to prep us for announcing a come back. But the UNCONTROLLABLE laughter came a couple of weeks after that when Janece called me to tell me to turn on the Today Show. Why? 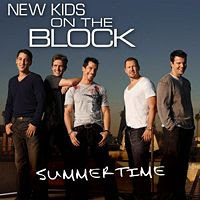 Because the NKOTB were on it of course! They were announcing their come back! LOL That was hysterical to watch!! first, love those pics of you, you little cutie! and 2nd I am right there with you. I remember you getting that button and the jean purse it was on. 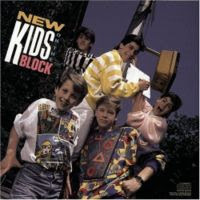 I remember getting a NKOTB nightgown. It was white with neon green piping. HOT STUFF! Joey was my love, too!! I just thought he was the cutest, and the most "our age", though that was older than us! So fun that they are back and with a new album. I haven't listened to the whole thing, but yesterday I heard a double play of Hangin Tough, and Please don't go girl, on the radio for Friday night 80's !! I just smiled! My friend, Katie, you can link to her off of me does Flashback Fridays, too, and she is so fun- she was YW president here and I was her counselor- she recently moved but we keep up by blogging! Love that you are so avid now!! How funny! Here I thought I was being original with Flashback Friday's, LOL! I'm a bit jeleous that you heard my song *wink* the only song I come across is "Hangin' Tough"...ugh haha! Come on- who didn't love the New Kids? Danny, Donny, Joe, John and Jordan? Sounds like "The Right Stuff" to me! This is such a great idea. I can't wait for your next one. Amber...you are hilarious! At the time I couldn't have been more convinced that they had the right stuff. Time will tell if "the stuff" is still right. LOL!